Here’s a short primer on President-elect Buhari and what these elections mean for Nigeria. Muhammadu Buhari first ruled Nigeria from January 1984 until August 1985 after a military coup. His legacy is mixed. His previous government took a hard line against corruption and Buhari maintains a rare reputation for honesty among Nigerian politicians. On the other hand, his attempts to re-balance public finances resulted in job losses and economic disruptions. He also restricted freedom of the press while in power, jailing of two journalists. Buhari has defended his military coup in 1983. “If you choose correct leadership, there won’t be any need for the military regime,” he has said. “The military came in when it was absolutely necessary and the elected people had failed the country.” Buhari himself was removed from power in a later military coup. Buhari was defeated in the last three elections. However, in this round of elections, he was supported as a candidate of the All Progressives Congress (APC). APC is composed of many prominent defectors from Jonathan’s PDP, which has been at the forefront of the political scene since the end of military rule in Nigeria in 1999. Buhari campaigned as a born-again democrat focused on cleaning up corrupt politics to allay fears that his ruling would mark a return to a strict military regime. As a Sunni Muslim from northern Nigeria, Buhari’s religion has made it difficult to win support among Christians in southern Nigeria. After surviving an attack from Boko Haram on his convoy in July 2014, Buhari vowed to end the insurgency within months if elected, blaming President Jonathan for failing to remove the group. Many Nigerians hope he can use his military background to counter Boko Haram insurgency in the north, where he is popular among the poor. 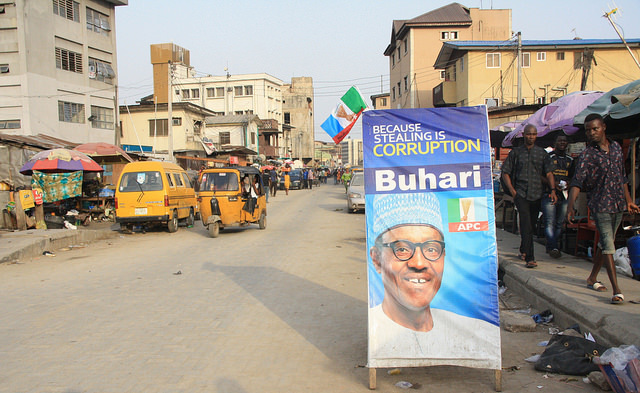 Elections in Nigeria have been typically marked by violence and corruption. In the time since campaigning began in mid-November, the ruling and opposition parties have reported violent attacks that have resulted in the deaths of many supporters. Nigeria’s elections were originally set for mid-February but were postponed for six weeks due to potential security concerns as military resources were devoted to fighting against Boko Haram. Fourteen candidates participated in the election, but Jonathan and Buhari were the only two seen to have a realistic chance of winning. While Jonathan still has support in his home region in the majority-Christian south, his government has faced backlash for its failure to combat Boko Haram. Insecurity, elite corruption among high-profile politicians and business leaders, and the state of the economy all ranked high among voter concerns. This time, the Independent National Electoral Commission (Inec) was charged with enforcing election procedures from vote-counting – the candidate with the most first-round votes and at least 25% of the votes in two-thirds of Nigeria’s states wins – to instating new biometric cards to stop voter fraud. But Inec faced a special challenge in the north, where roughly one million people displaced by the conflict with Boko Haram had to cast their votes at specially provided facilities. International and local observers including the European Union would not deploy observers in the north-east due to security concerns. Inec’s job is not quite finished. On April 11, Nigerians will vote again to elect new governors and state assemblies for 29 of 36 states, including large and economically powerful Lagos, Kano, and Rivers. Nigeria has the largest economy and population of any country in Africa. Last year, it overtook South Africa to claim the region’s largest economy and is one of Africa’s largest oil producers and a main supplier of crude oil to the United States. Citizens though complain that the wealth of the country from oil exports do not reach the average citizen, as roughly 70% of Nigerians live below the poverty line.